Warm spring weather has finally arrived, bringing with it the long-awaited sunshine. Individuals from Cuyahoga Falls, Ohio, to Niles, Ohio, who feel the positive, motivating effects of the beautiful, blue sky love to be outdoors and love going on adventures! Anyone who is looking to go on an adventure can take advantage of the fun craft classes at The Burlap Shack, while finding the perfect handmade primitive and farmhouse home décor for their humble abode or anyone else’s. This local gift shop not only has reclaimed wood and upcycled products as gifts for people who have everything, but they also offer their thoughtful handmade fabric memory keepsake roses for those mourning loved ones. Their unique custom designs are also perfect for anyone from Cortland, Ohio, to Canfield, Ohio, searching for a fun and different private and birthday party venue for children’s parties and adults alike. Take time now to visit The Burlap Shack in person, on their website, Facebook, or shop their eBay store and support the Akron eBay retail revival program! Birthdays are celebrations of life when someone can recognize the joy that a loved one brings to their life. 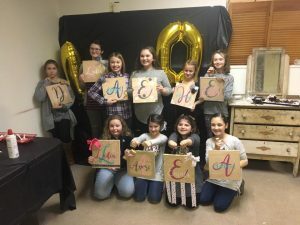 The Burlap Shack is the perfect place for children’s parties by helping them tap into their creative side by decorating unicorns, plaques with their initials on them, or anything else that might interest them. Anyone from Niles to Canfield looking for a birthday party venue for a few close friends of any age can call The Burlap Shack to book a private party or visit their Facebook Page to see when upcoming craft classes are scheduled. The Burlap Shack sold out of their Porch Bunny Craft Class Night because of its popularity but quickly scheduled another to accommodate more people. They provided all the materials that might be necessary to create a 43”-tall primitive, modern, country, or shabby chic bunny to match any personality. This local gift shop recently invited people to a night of fun to create their very own wooden “welcome” sign shaped like a watermelon. 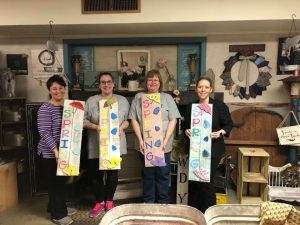 Additionally, their most recent craft class had attendants make a spring sign that stood 30” tall with additional wooden pieces that included an umbrella, rain boots, and rain drops, as well as ensuring that extra additions were available for personalization. The Burlap Shack was established alongside one woman’s fascination with creating unique custom designs out of neckties. She would be given neckties by women at church who had lost their husbands to create a handmade fabric memory keepsake rose to forever cherish and symbolize their union. Her business evolved gradually into a full-time venture as demands increased, and she opened a storefront in 2014. Her mission is to welcome each customer as a friend, and with this attitude, gained a partner in 2017. This local gift shop is filled with their very own handmade primitive and farmhouse home décor made from upcycled and reclaimed wood products. Anyone from Cuyahoga Falls to Cortland who walks through the doors immediately feels welcome and can find gifts for people who have everything — including hairbows and coffee cups, wooden signs, and t-shirts with sayings. 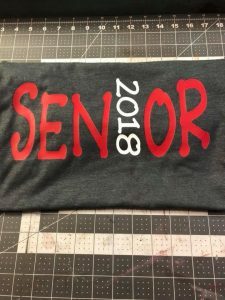 They not only enjoy creating their own one-of-a-kind pieces, but they also excel at creating unique custom designs for those who are looking to fill a specific need or occasion. They are a valued pillar of the community with their reputable business methods and were chosen as a pivotal component of the Akron eBay retail revival program. The Burlap Shack is forging ahead and into the future! The Burlap Shack can quickly become anyone’s preferred location to visit, whether someone from Cortland, Ohio, would like to find a Father’s Day gift or another individual from Cuyahoga Falls, Ohio, has been eyeing a handmade piece of farmhouse or primitive home décor for their living room wall. Perhaps a parent is searching for a private children’s birthday party venue or a handmade fabric memory keepsake rose for a friend who has experienced a family death. This local gift shop offers unique custom designs created out of upcycled and reclaimed wood products as gifts for people who have everything. Anyone from Niles, Ohio, to Canfield, Ohio, who would like to take advantage of the specials from the eBay retail revival program or fantastic and creative craft classes can count on the wonderful people at The Burlap Shack! This entry was posted in Antiques & Collectibles, Arts & Crafts, Craft Classes, Craft Classes, Education, Entertainment, Gift Shops, Shopping, Specialty Shops and tagged birthday party venue Cuyahoga Falls Niles Cortland Canfield Ohio, children's parties Cuyahoga Falls Niles Cortland Canfield Ohio, craft classes Cuyahoga Falls Niles Cortland Canfield Ohio, eBay retail revival program Cuyahoga Falls Niles Cortland Canfield Ohio, farmhouse decor Cuyahoga Falls Niles Cortland Canfield Ohio, gifts for people who have everything Cuyahoga Falls Niles Cortland Canfield Ohio, handmade fabric roses Cuyahoga Falls Niles Cortland Canfield Ohio, handmade home decor Cuyahoga Falls Niles Cortland Canfield Ohio, local gift shop Cuyahoga Falls Niles Cortland Canfield Ohio, memory keepsakes Cuyahoga Falls Niles Cortland Canfield Ohio, memory roses Cuyahoga Falls Niles Cortland Canfield Ohio, primitive decor Cuyahoga Falls Niles Cortland Canfield Ohio, private party venue Cuyahoga Falls Niles Cortland Canfield Ohio, reclaimed wood products Cuyahoga Falls Niles Cortland Canfield Ohio, The Burlap Shack, unique custom designs Cuyahoga Falls Niles Cortland Canfield Ohio, upcycled products Cuyahoga Falls Niles Cortland Canfield Ohio by admin. Bookmark the permalink.